There are more than Maples out there. More than Magnolias and Dogwood trees. Believe it or not, more than Flowering Cherries! Most people go tree shopping and they are headed to find one of these four common trees in the Pacific Northwest. Every once in a while they search out something special from their past. They say things like ‘when I was young we had the most beautiful tulip tree, where I come from we make tea from the Linden tree, or as a child I had so much fun climbing a willow tree’. Many people have a certain tree that holds a place in their hearts. A tree associated with good memories, good places and good people. Sometimes they look for these memorable specimens, but usually they want what everyone else has. A mundane maple or a familiar Flowering Cherry. These trees are remarkable, but so are hundreds of others that can grow in our climate. 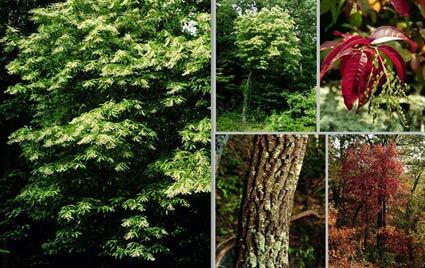 One of these is the Sourwood or Sorrel Tree. It’s showtime now for Oxydendrum arboreum with it’s blazing crimson red color. This tree is native to the Southeastern United States and is in the Ericaceae family, growing well with it’s family members the Heathers, Heaths, Azaleas and Rhododendrons. All of these plants share a preference for acidic soils which is the reason they grow so well in the Pacific Northwest. The common name comes from a sour flavor which is produced when the leaves are chewed. It can help alleviate a dry mouth. The white flowers that bloom in summer are reminiscent of lily-of-the-valley and form panicles that are 4-8 inches long. These flowers ripen to silver-gray capsules which will persist into the winter. Another great tree that will fill out any landscape! Slow growth rate to 30 feet (9 m) in cultivation, greater in the wild. Very pretty – have never seen one, but then our soil is not acid enough here. The fall color is terrific on this one! I love this tree and planted one last fall but why isn’t it blooming this fall? Sometimes plants need time to bloom,from months to years. It should be blooming in summer, with the flower bracts persisting into fall. Could also be it’s in too much shade? It was in bloom when I purchased it last fall. It’s in a place that gets about 4-6 hrs of sun a day. Beautiful tree…love the color, shape and bark!